I almost jumped off the upper deck of the shiny red tour bus we were on the moment my eyes spotted this tiny shop. The sun was setting and we did not have time to wander around, but I refused to go home without stepping foot inside this very famous shop. This is the same shop that was written into Alice Adventures over 150 years ago. 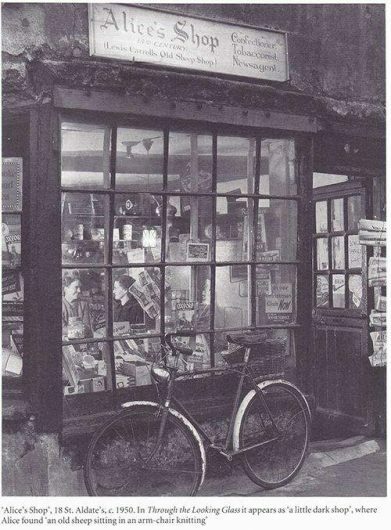 The same shop where Alice would buy her favorite barley sugars. How awesome is that! 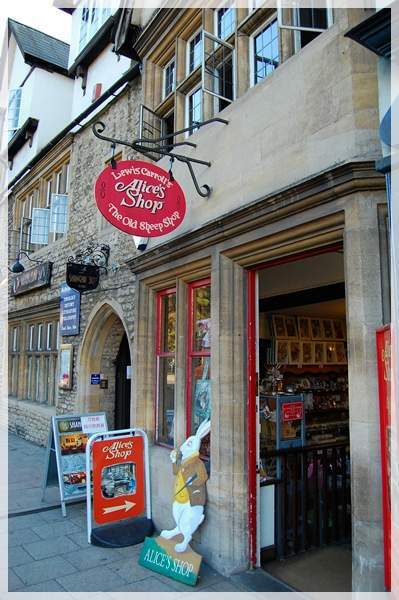 Alice’s Shop, opposite the entrance to Christ Church Meadow on St. Aldates in Oxford, is stuffed with Alice memorabilia since the mid-60s. It has been a grocery store before then but has been dubbed Alice’s Shop ever since the stories became famous. Charles Dodgson—aka Lewis Carroll—the author of the book, was a tutor at Christ Church college at Oxford University when he wrote Alice in Wonderland. The dean of the college had a daughter named Alice Liddell, who served as Carroll’s inspiration for the protagonist of his story. The shop seemed to be full of all manner of curious things-but the oddest part of it all was, that whenever she looked hard at any shelf, to make out exactly what it had on it, that particular shelf was always quite empty: though the others round it were crowded as full as they could hold. ‘Things flow about so here!’ she said at last in a plaintive tone, after she had spent a minute or so in vainly pursuing a large bright thing, that looked sometimes like a doll and sometimes like a work-box, and was always in the shelf next above the one she was looking at. Stepping into this tiny shop was like stepping into the book—it was so surreal. Photography isn’t allowed inside the shop so I do not have pictures to show you of how things are setup inside, but thankfully things did not flow about like how Alice had observed. In Alice’s Shop you’ll find jewelry, accessories, clocks and pocket watches, bags, art, tea towels, ornaments and figurines, jigsaw puzzles, and stationeries. While I enjoyed and was thoroughly fascinated with everything displayed in the stop, I did not really buy anything. Maybe next time. 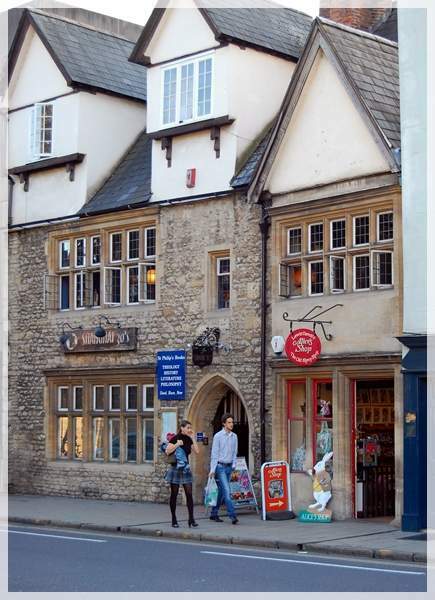 See how I’ve lived in the UK for just a little under 3 decades and have never been to Oxford? How shameful is that? With your post of this gorgeous piece of history I have decided that I must go! I haven’t been to Oxford for years but have planned a trip to Giffords Circus this summer which is there on the dates I want. Planning a day out in Oxford before hand so this is firmly on the list – and now I know the back story. Sally, I’ve heard and read so many good reviews about the Giffords Circus. I look forward to read all about your experience. Have fun! that is simply fascinating! It is one thing to reach what you see in the movies but to see what you actually read in classical books, I think that is the ultimate allure of travel for me. I am guilty for I have yet to read Alice in Wonderland. My education didn’t put emphasis on literature hihi. But London is one place we dream to visit. Thank you for taking us there today. I haven’t seen the movie yet! Is it good? I’ve only read the book and that too years ago. But I heard Alice in Wonderland is a visually stunning film. We went to Oxford last year but I didn’t even know this place existed! I wanted to go on the Harry Potter tour but Mr. T is not a believer lol! I may convince him to take us there again to look into this wonderful shop inshallah!